i can’t think of a better way to celebrate national cupcake day yesterday than a sneak peek of the city’s newest cupcake bakery. lauded by the los angeles times as the “progenitor of the haute cupcake craze,” sprinkles cupcake opens its doors officially thursday morning (december 17) at 9am. a west coast favorite, this will be the company’s 18th store, the first sprinkles location in tennessee. with most bakeries, you are limited to their store hours. in 2012, sprinkles cupcake raised the bar: a 24-hour cupcake ATM. this week, nashville gets their first sprinkles cupcake ATM as well. around the clock access to cupcakes in case of emergencies. the only consistent flavor in the ATM will be their red velvet which is vegan, sugar free & gluten free should you need a healthy option. the kitchen bakes fresh daily and almost 24 hours a day since the bakers arrive every night at 2am. 12south’s newest ATM, dispensing only cupcakes. all day. every day. the 12 south community will probably collectively gain 15 pounds in 2016 because also joining the neighborhood this week is five daughters bakery, a place where even the smartest and brightest pastries can only hope to be born. known around town already for their much sought-after “100 layer donuts” thanks to coffee shops like barista parlor, ugly mugs and jam coffee house, 5d will also offer up croissants, cinnamon rolls, biscuits, you name it. the 100 layer donut though, history will prove this to be their signature pastry most likely. this croissant/donut combination takes 3 days to craft. once cooked, the 100 layer donut is rolled in sugar, filled with cream cheese, and topped with a heavenly glaze. five daughters also offers up a healthier donut choice called the paleo crusher. same deliciousness minus sugar, gluten and dairy. i’m not terribly sure how that’s possible but try it. 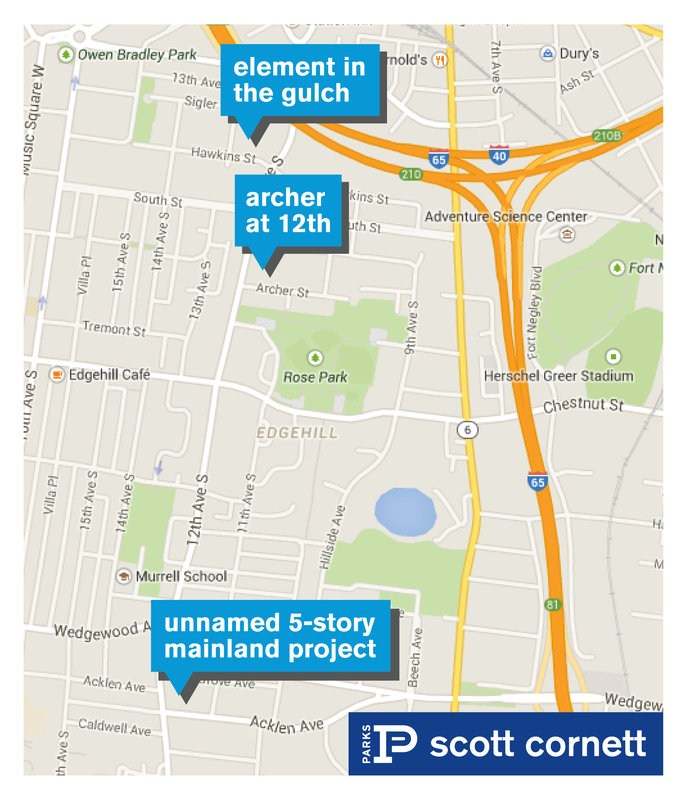 as land in the urban core continues to become a premium, investors are discovering areas in between hot neighborhoods like 12 south and the gulch as ideal opportunities. last week, nashville real estate investor treg warner paid $2.1 million for the drive-thru liquor market on the corner of 12th and wedgewood avenue. no official word of his plans for the .41 acre lot but he also owns the lot behind it and last year, he purchased the lot that thai esane currently sits on at 907 12th avenue south. about five blocks south of the gulch, nashville-based evergreen has started demolition at the corner of 12th avenue and archer for the upcoming archer at 12th project. they plan to build 49 free-standing brick brownstones facing the city with the option of garages and rooftop terraces. the 3-story homes will span down archer starting at 12th all the way to the cul-de-sac a couple of blocks in. the first phase will be completed by spring 2016.
an announcement was made this week that mainland cos. would build a 5-story, 75-unit apartment building above a 2-story parking garage where the special olympics headquarters currently sits at 1900 12th avenue. the .80 acre lot was purchased three months ago. the special olympics is relocating this summer to 461 craighead street in the melrose area. construction may start as early as june. 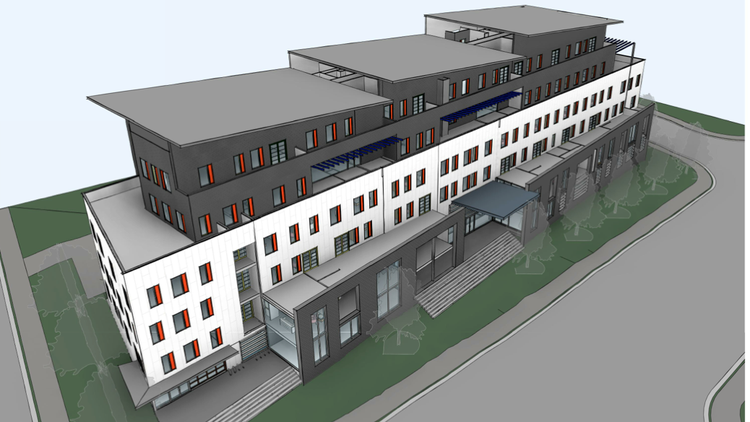 unnamed apartment project developer mainland presented to the 12 south neighborhood april 11.
groundbreaking on phase I of element gulch, a 19-unit residential project, should start later this month at the corner of hawkins street and 13th avenue south. 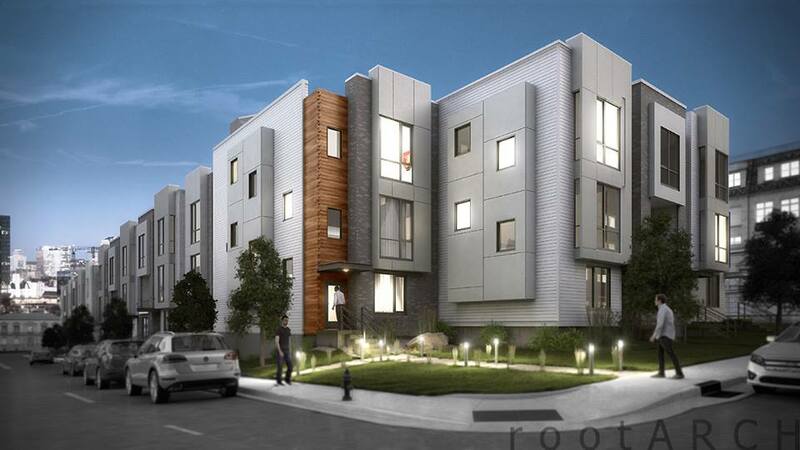 with nashville-based developer bill ruff at the helm, base prices on a 3 bedroom/3.5 bath will begin at $519,000. more updates soon on the redevelopment of edgehill village area too which will continue to shape this part of town. this week two much-anticipated new hotspots open their doors. yesterday, the creators of the catbird seat and patterson house unveiled pinewood social, a social club that includes a restaurant, bar, coffee shop (provided by beloved crema), bowling alley and private karaoke/meeting rooms, as well as a pool with an airstream tiki bar, shuffleboard, & bocce ball coming in spring 2014. 12 south’s restauranteur miranda whitcomb pontes who created both frothy monkey coffeehouse and burger up on the strip, launches her latest effort, josephine, this week as well. with chef andy little at the helm, the restaurant carries a true farm-to-table philosophy, working with local farms like triple l ranch out of franklin where the cattle are raised on green pastures without any growth hormones or antibiotics. they hope to have their own garden to draw from as well in the spring. as a tip of the hat to the community, the two large tables near the patio were fashioned from bowling lanes from the former melrose lanes which was demolished in the mid 2000s. hundreds turned out last week for the street week free ice cream preview of 12south’s new jeni’s. jeni’s ice cream is the first in a huge string of new changes on the strip. as 12south flats construction is winding down, new tenants will begin filling up the apartments. the building is currently already over 50% leased offering a lot of new life walking the streets. and with more people moving into the community, comes new things to do and some necessary expansions & renovations for others. up next is jeni’s neighbor, cadeau, a southern chic home store who is relocating from columbia, tennessee. they plan to be open within the week. owner and founder frannie preston daughrity, granddaughter of former BMI president frances preston, made the decision to transplant the store into the heart of 12 south after she and her family recently moved to nashville themselves. “looking at different areas of town, it became clear that the 12south neighborhood was the right one for cadeau nashville. there are new homes and renovations on every block, and there is so much energy there,” daughrity says. frothy monkey went through a whirlwind facelift earlier this week which was unveiled on wednesday all new and improved. they begin serving wine and beer, only adding to their existing dining experience. the monkey is not just a coffeehouse anymore…now if they could only keep everything bagels in stock until i get there. las paletas recently vacated their less than 800 sqft space next to burger up and progressed into a much larger space across the street from sevier park. sevier park is also seeing its share of changes. the 20-acre park is getting a sleek new two-story community center which will feature a fitness room, gymnasium, track, dance room and a multi-purpose room. it will be fully staffed during operating hours and will offer programs like zumba, yoga and different types of dance classes. the first phase of the park’s master plan also includes a new parking lot and trails. it has a $4 million budget and should be operational by late fall. coming in november, the folks behind kalamatas are launching a new lebanese bistro endeavor across the street from burger up called epice. the 1,500 square foot spot should compliment the street well offering something new. josephines, miranda whitcomb pontes’ new venture next to taproom, is also on the books for late october/early november right now. this will be her third 12south launch after previously opening frothy monkey coffeehouse and burger up. she’s been pretty tight lipped about the concept thus far only saying “it isn’t fussy”. a smokehouse concept from the creators of urban grub? lastly, two spots that are bubbling under: the creators of urban grub are working on a concept for this long vacant space next to frothy monkey (above) which should be announced at the end of the year and be open first of the year. also, something is brewing next to mafiozas which is requesting an outdoor patio area from metro codes. it’s called embers restaurant on the paperwork submitted to the city. personally, i want a bakery…can we get beckers back?